My eldest son, Riley, and I took a stroll down to the bottom paddock today to check the fence lines and the milk shed. I noticed that one of the wires had snapped, so I have made a mental note (and now a written note) to take some tools down tomorrow and fix the fence. I took the chance to check out the old milk shed and ensure that it was not unsafe for the horses. 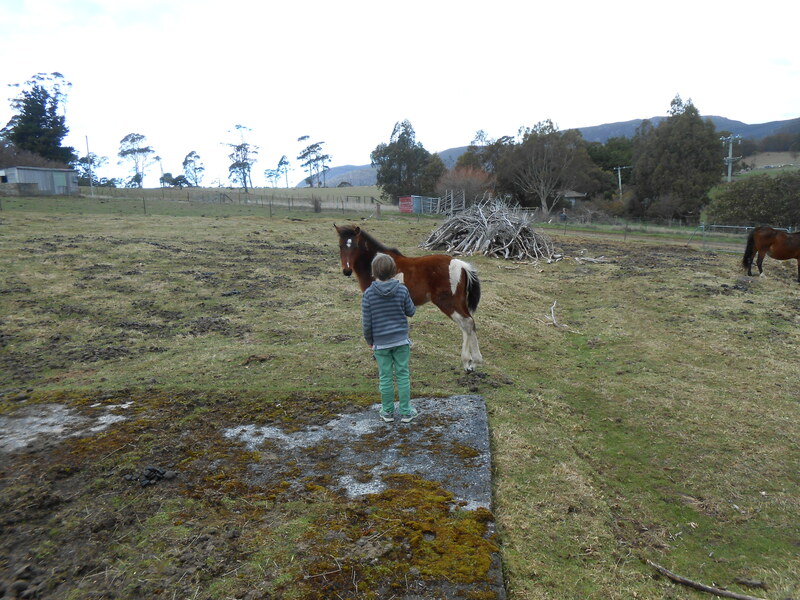 I found that some of the tin roof had fallen in due to the winds we just experienced in Tasmania, so I moved them to a safe location to make sure the horses were not injured. Riley and I watched the two horses for a while and chatted about them, and I guess they were curious about us too. They both came over and we gave the mother a nice scratch behind her ears. Her foal was too timid to let us touch it, yet I feel it was warming up to us. After this pleasant afternoon walk I went back to work on the rabbit skins. To make them softer and easier to work with I was rubbing the skin side on a tree trunk. This seemed to be helping, yet it is too early to say much about it. Once I made space on the drying board I was intending to slaughter some of my younger rabbits, yet just when I was preparing my tools the heavens opened and it began to rain. I decided that the task could wait till tomorrow and I set about some of my indoor duties.